How does Gaiman package up an utterly complete story and present it so perfectly? Stardust is an intricately woven tale that weaves together many lives and paths in such a seamless way that either a mad man or a genius had to write it. Stardust primarily follows the journey of Tristran Thorn to retrieve a fallen star for a girl he is trying to win over. On the way away from and back to his home village of Wall, Tristran encounters many sorts: a talking tree, a fallen star in the form of a girl, a unicorn, witches, and more. The story moves in a most unusual way, from carefree and child-like to dark and gory. We see the end of both those who have helped and those who have hurt Tristran along the way. I can’t even begin to try to share an example of how so many details work together to form this story without giving anything away. There are about seven or eight different paths in this story that work with, against, and next to each other yet they are all connected. It may sound confusing, and a few times in the beginning it was, but as the story progressed it all ironed out and all of these veins made this book absolutely magical. The awesome thing about reading about so many different paths is that they all have their own and unique endings. You read one book and get eight endings!!! 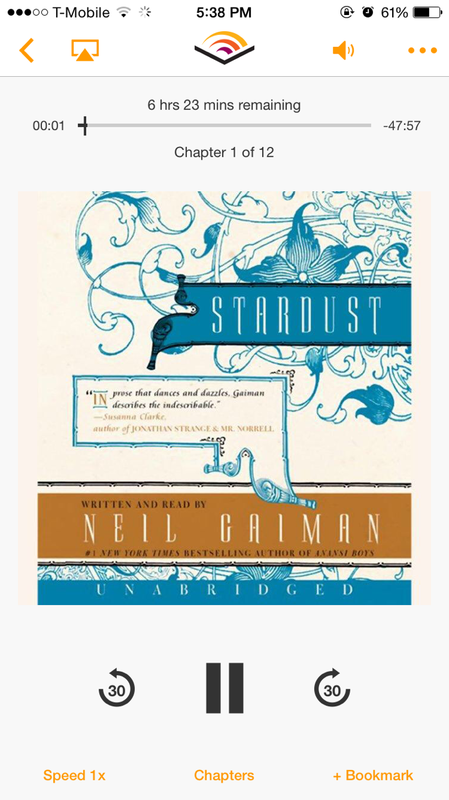 After reading The Graveyard Book and now Stardust, I feel safe saying that I am a Neil Gaiman convert. I picked up another book of his and will read it once I read through a little more of my TBR pile. I listened to this one as an audiobook and it is read by the author. I find those audiobooks to be the best, aside from Khristine Vham’s phenomenal reading of the Jane Yellowrock series.